IBM® Aspera Streaming for Video can revolutionize the way live and near-live high definition video is reliably delivered. It leverages commodity Internet instead of expensive satellite and dedicated fiber. The software is built on Aspera's unique FASPStream™ technology that is designed to guarantee timely arrival of live video and data – even with increased network round-trip delay and packet loss. 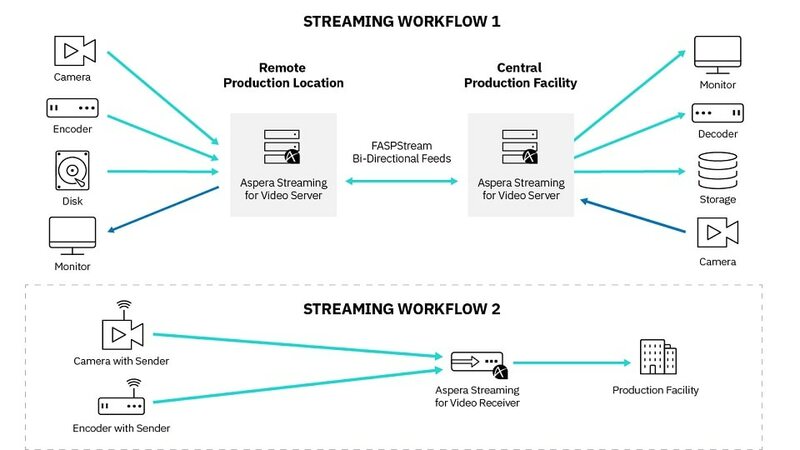 IBM Aspera Streaming for Video software offers easy deployment and centralized administration using existing video infrastructure. It addresses many use cases for live contribution, primary distribution and remote production of live events. Save considerable costs by reducing or fully replacing satellite delivery services with much more affordable terrestrial IP networks. Delivers ultra-high resolution live video in near-real time over IP networks with negligible start-up delay/pre-buffering – independent of distance and network conditions. Easily integrates in cloud and hybrid environments, enabling more video on demand and production workflows for transcoding and distribution. Fully uses the available network bandwidth to send and receive broadcast quality video streams – even over challenging networks and little bandwidth. Encrypts streaming video in transit and securely authenticates using proven standard public/private key authentication or Aspera's multi-tenant access key system.